Samsung has announced at IFA 2018 press conference the launch of the new Q900R QLED 8K TV, a device that includes the 8K AI Upscaling. Samsung QLED 8K TV is available in four large sizes (65 inch, 75 inch, 82 inch and 85 inch) and it will feature several 8K-ready enhancements including Real 8K, QR HDR 8K, and Quantum 8K. The new Samsung QLED 8K will be available in stores from the end of September. The Samsung QLED 8K with 8K AI Upscaling is part of the company’s long-term vision of bringing 8K technology to the mainstream, making it the most accurate and clear such device the market. In order to display the 8K quality images, the Samsung Q900R has a Real 8K resolution that has a brightness of up to 4,000 nits. That’s a standard that most movie studios have. This cool feature allows the TV to produce four times more pixels than a 4K UHD TV and 16 times more pixels than a full HD TV. I just hope that the 8K content will be available soon. QD HDR 8K, a technology that’s based on High Dynamic Range 10+ (HDR) technology which optimizes TV brightness levels and produces impeccable colors and images, is also built-in in the TV and it will deliver images consistent with the vision of content creators. Samsung 8K AI Upscaling technology, based on artificial intelligence, delivers image and sound quality to an 8K-compatible level, regardless of the original source quality or format. Whether a user watches content through a streaming service, set-top box, HDMI, USB or even mobile mirroring, the Quantum 8K processor recognizes and improves content to broadcast on 8K . In addition, the Q900R features the Direct Full Array Elite feature for enhanced contrast and precise backlight control as well as a 100% color volume, allowing users to be fascinated by a billion color shades for accurate accuracy unmatched image. 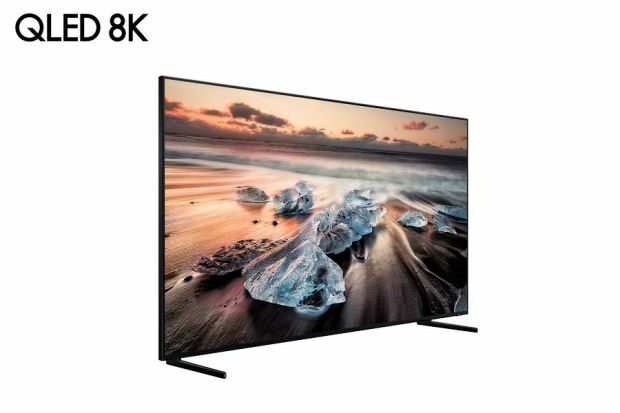 Samsung Q900R QLED 8K TV offers new features that allow consumers to use the TV differently, while maintaining the highest picture and sound quality. For example, the TV recognizes and analyzes a number of connected entertainment devices, such as optical cable devices with One Remote Control, and can automatically switch the picture source and audio output of the TV for an optimized viewing experience. Ambient mode has been enhanced to perfectly integrate the TV into the surrounding area, with images, useful information, and more. One Invisible Connection comes with a standard length of 5 meters, incorporates the optical cable and power cord, and gives users more freedom as well as the ability to place TV in other areas. Smart TV capabilities, such as SmartThings, add the Q900R to the ability to give users greater access to information and simplify their lives. Samsung will present the latest TV and audio advertisements in its IFA space located at Level 2 at City Cube Berlin.